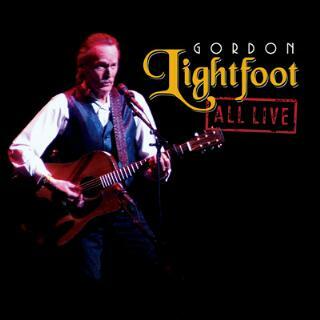 Warner Music Canada is proud to be able to announce the Tuesday, April 24, 2012 release date of the Gordon Lightfoot album All Live. The album is currently available for pre-order and will be available at all physical music retailer as well as Digital Service Providers. It is the musical highlight of every calendar year when Canadian Music legend, Gordon Lightfoot announces his run of concert dates at Toronto’s storied Massey Hall. Last May 25th, 2011 marked Gordon’s 150th concert at the hallowed hall in the past 40 years. In 1978 he played a remarkable 10 shows in 9 days, selling out each and every night. Now, for the first time ever, Gordon has gone through the archives of live recordings from Massey Hall and has picked the finest performances recorded between 1998 – 2001. “The recordings have not been technically altered and are authentic live mixes,” says Lightfoot of the album. Fans will hear each song exactly as it was performed that night – no over dubs, no mixing – ALL LIVE. Concurrent to the album release announcement, Gordon Lightfoot is announcing the onsale of tickets for his 2012 run at Massey Hall, November 14, 14, 16 and 17, 2012. Tickets for the 2012 Massey Hall dates go on sale Friday, March 2, 2012 at 10:00am. Fans buying tickets through the Roy Thomson Hall box office (416-872-4255) or www.masseyhall.com will also have the option of adding the new album to their purchase. All Live will be delivered to these ticket holders on or before the Friday prior to street date. How could one possibly describe in one paragraph the impact Gordon Lightfoot and his music has had on Canadian culture. Just a line list of some of his songs paints a vivid portrait of our nation; “Early Morning Rain,” “Canadian Railroad Trilogy,” “The Wreck Of The Edmund Fitzgerald,” “If You Could Read My Mind,” “Carefree Highway” and “Summer Side Of Life” are only a small sampling. On Thursday, June 14, 2012, Gordon Lightfoot legacy will be further enhanced when he will be inducted into the Songwriters Hall Of Fame in New York City in the performer category alongside Bob Seger, Don Schlitz, Harvey Schmidt, Tom Jones and Jim Steinman. Gordon Lightfoot has won 15 Juno Awards and been nominated for 5 Grammy Awards. He was inducted into the Canadian Music Hall of Fame in 1986 and the Canadian Country Music Hall Of Fame in 2001. In May 2003 was made a Companion of the Order of Canada and is also a member of the Order of Ontario, and in 2004 was inducted into the Canadian Songwriters Hall of Fame.